Institutionalising data-driven decision making is the need of the hour, and while the world is capitalizing on the tech du jour AI, this Mumbai-based company founded in 2016 is going the extra mile by specialising the field of AI, NLP and big data computing, and providing real-world solutions with human-like intelligence. With a huge competitive edge over others, the startup founded by Parnil Mhatre concentrates on a broad range of analytics solutions — predictive analytics, social behaviour filtering, social media intelligence and big data architecture — with machine learning underpinning the solutions. With Artificial Intelligence Lab at its core, Quantum Four extensively uses science, mathematics and machine learning. “We believe that solving problems of the future needs AI for the simple reason that in today’s world of hyper-information, human experience may not always be available. A learning system can be the only solution to bridge this gap,” says Mhatre, who has deep expertise in neural computation, genetic algorithm and NLP. With a team of highly trained mathematicians, big data programmers and business analysts, the startup boasts of a big data parallel computing as an infrastructure backbone to all their AI solutions, thereby satisfying the industry’s volume and velocity needs. 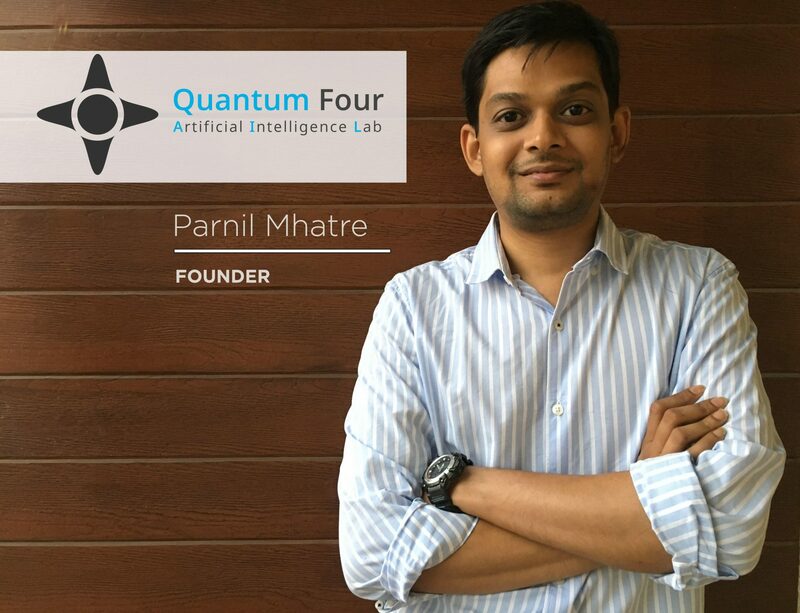 With this strong backbone, Mhatre aims to nurture Quantum Four into AI labs which does not focus on a particular technology but rather challenges itself to apply a customised array of solutions depending on the business problem at hand. With an aim to create solutions that are beyond conventional and truly intelligent, Mhatre built his own AI algorithm to predict human behaviour called Social Behavior Filtering, which has been widely used in the fintech space. The first ever SBF is currently being used in India’s fastest growing short-term lending fintech company called CASHe to make lending decisions worth 300 Cr easier. When asked what inspired him to make this algorithm, Mhatre shares that human behaviour is an extremely difficult problem to solve mainly because it is impossible to classify behaviour into separate categories. “Behaviour is more of a continuous entity. Intuitively we are aware, that even if we know everything about a person it is very difficult to predict his specific behavioural patterns,” he said. Keeping this in mind they built an AI algorithm to track and forecast human behaviour called ‘Social Behavior Filtering’ (SBF) which uses an entirely different set of mathematics called ‘Graphical Modelling’ to solve this in a tangible way. “Google’s page ranking is one of the very few exceptions which is based on similar mathematics. We consider individual to be part of a larger network, a network made up of not just individuals but all the relevant pieces of information. Our algorithm learns from all this and can predict even extremely abstract behavioural patterns,” explains Mhatre. Today, SBF is being successfully used in a leading Fintech company and has aided lending decisions worth ₹1,500 crore within a short span of two years. On being asked how did he start Quantum Four, Mhatre quickly adds that he has always been a passionate advocate of artificial intelligence and likes to come up with ingenious and innovative applications of AI across various sectors. “I detest plug and play solutions. It was with this background, I started Quantum Four – an A.I. lab where science, mathematics and technology would be the drivers for all solutions,” he shares. Talent Crunch: Mhatre believes that there is an enormous talent crunch mostly because people who are doing AI do not have a mathematical background. “I have seen a lot of companies run AI-like technology but the reality is AI is still a science and it will remain a science for the foreseeable future,” he said. He emphasises that until there is a right type of mathematician, software engineer and domain experts, AI-based tasks cannot be done effectively. “In order to use AI to its fullest potential, you need a team that can do science (mathematics), understand technology (big data) and most importantly communicate the results in the most effective way to the decision maker,” shares Mhatre. “In an organisation whose obvious focus is not AI, it is extremely rare to find this sort of a team and Quantum Four with its Enterprise Solution – Massive Dynamic Platform sits in the middle of these three worlds,” he adds. Perfect AI Is Still Far Away: “We have not reached the age of perfect AI or singularity, and we are far away from it,” says Mhatre. He believes that what we have done today is re-engineer a certain aspect of intelligence. “For e.g. We can differentiate between the shape of a car to the shape of a human being. And we can also differentiate between certain phonetics which lead to speech recognition and so on. With respect to developments of AI. in India, our country is one of the places where it is thriving as a lot of business leaders want to internalise AI. However, there is a gap between doing some sort of AI and the sort of A.I that delivers ROI,” he adds. Data Compliance: Mhatre shares that one of the main challenges they face is data compliance. “When we meet our clients, in order to research their data, we need to cross a lot of legal hurdles which delays initial involvement. Hence within Massive Dynamic, we have designed AI bots that can reside inside the company infrastructure itself and perform all necessary computation by pulling the algorithms in, rather than pushing the data out of the company security domain,” he said. The startup is looking forward to launching their Enterprise Solution ‘Massive Dynamic’ this year, that allows them to do science seamlessly on top of cutting-edge technology. “Massive Dynamic is our proprietary Next Gen ‘AI Enterprise Solution’ that has one of its kind interfaces, with an in-built sophisticated toolbox equipped with all the latest machine learning algorithms. It is where business leaders/scientists can generate AI-based solutions with the help of their experts, mine insights via dynamic visualisations and come up with tangible decisions for their real-world problems, said Mhatre. The system is based on big data which does all the heavy-lifting to learn from the data itself by handling all the technical and scientific necessities that may arise and thereby implementing AI backbone for any business. The best part about this solution is that the base platform is sector agnostic, where customization is done on business specific requirement for a speedy and cost-effective production system. However, they wish to work on the entertainment sector, human resource, logistics and healthcare especially in the areas of nutrition and genetics. “Nutrition is heavily dependent on individual behaviour and a regular track of the individual’s behaviour (how much one travels, eats, stress levels etc) is used in combination with data sources like wearable devices and mobile data, the nutrition recommendation can be highly customized and near accurate,” he said. Another area they want to make an impact is logistics. “Here, what we want to do, is take driver data, vehicle data, type of consignment, road quality and specifically traffic situations into consideration. In addition to it, we not only want to add current weather data but also predict future weather conditions that might exist.,” he said.